The whole of Finland is now buzzing about bioeconomy. The Finnish bioeconomy strategy defines bioeconomy as an economy which uses renewable natural resources when producing food, energy, products and services. The strategy also states that through developing bioeconomy, Finland will create economic growth and new jobs while also securing the diversity of the natural ecosystem. Tanja Häyrynen explains. The goal of Finland’s strategy is to reduce dependency on fossil-based fuels and prevent the impoverishment of our unique environment. According to Eurostat, Finland was in 4th place in overall share of energy from renewable sources in the EU in 2014, with a RES-share of 38.7 %. We have already reached our target share (38 %) but there’s still a lot to be done and many opportunities for renewable energy sources. The arctic rural areas of Lapland are doing very important work in the field of renewable energy sources. Lapland aspires to be a carbon-neutral area in the future. This will happen only if we work hard together across different industry borders and share the same goal: to ensure better future for the next generations. But how do we do that? Lapland is committed to developing sustainability and self-sufficiency in regards to energy. This vast region, rich in natural resources, has abundant possibilities to harness as sustainable energy such as wind, water, biogas and solar energy. Currently, Lapland uses water power, local wood and forestry side-streams in energy production. We are currently working on the decentralised renewable energy programme which will be published in the spring 2017. The programme will be carried out together with different actors from the energy industry: entrepreneurs, researchers, educational institutions, the public sector, and more. We will have joint goals in regards to energy solutions in Lapland and also concrete actions with which to achieve these goals by the time of 2025. It’s time to get down to work and consider it done! Our ambitious goal in the future is to have 100 energy self-sufficient villages out of the 300 villages that exist in Lapland. But how? As said before, there are abundant possibilities in sustainable energy production in Lapland. A lot of those opportunities haven’t been used yet. That is why we have to support the establishment of new kinds of entrepreneurship in the rural areas of Lapland. It’s extremely important that new entrepreneurs see the possibilities of renewable energy production and seize the opportunity! 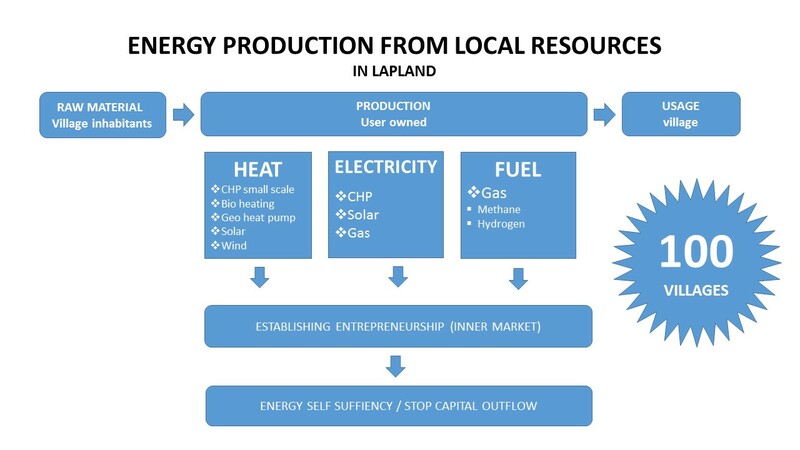 The energy production from local resources in Lapland starts from the raw materials from inside of the village. The raw materials can be anything from water and wind to wood chips and manure. The energy production is user-owned. In renewable heat and electricity production, combined heat and power plants (CHP) are very important for rural villages if they aspire to be energy self-sufficient. In renewable fuel production, we are focusing on biogas made from methane and hydrogen. The users of the locally produced energy are the local inhabitants. The possibilities of decentralised renewable energy production are one of the spearheads in the regional development in Lapland. One tool to implement the regional development in Lapland is the cluster co-operation. The purpose of the Arctic smart rural cluster is to put together an easily approachable network of experts and to boost local entrepreneurship. The goal in cluster work is that the energy solutions will support the vitality of the entire region of Lapland and prevent the capital outflow from rural areas. One way to achieve this goal is by establishing energy self-sufficient villages, which are already being piloted by ProAgria Lapland. The purpose of the pilots done in the Lappish villages is to change the course of development so that the outflow of capital from rural areas is prevented – by, for example, refinement of products and a circular economy inside the community. Side-streams from different industries (tourism, forestry, agriculture, reindeer) can be combined into profitable integrity. For example, wood chips and manure can be used in energy production and, at the same time, new jobs and well-being can be created in the rural areas. In this way, ProAgria Lapland’s pilots are sustainable not only economically and ecologically, but also socially. The future looks promising for the rural areas of Lapland. A lot of work is still to be done but the opportunities on the horizon are bright. Bioeconomy is one promising tool in the development of the rural areas of Lapland. Not only does it create economic growth and well-being in the region, but also takes into account the unique arctic environment of Lapland. We in Lapland are very excited about the opportunities that bioeconomy brings. We just have to roll up our sleeves and start working systematically together – yes we can! Tanja Häyrynen is a project manager of the Arctic Bioeconomy project at Regional Council of Lapland in Finland. Part of her work is to coordinate, communicate and ensure activities for the decentralised renewable energy development in Lapland for the future. To read more about the Finnish Bioeconomy Strategy, click here.